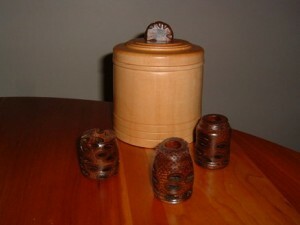 Each month we feature several different woodworkers in both our Wood News Newsletter as well as The Highland Woodturner, our monthly publication devoted to wood turning. In this month’s issue of The Highland Woodturner, we are featuring Diane Davison, a woodturner from North Olmstead, Ohio. Diane comes from a long line of male woodworkers and was first exposed to woodturning after watching her uncle turn when she was younger. She began doing her own woodworking over 20 years ago when she wanted to build a desk and later became a self-taught woodturner. 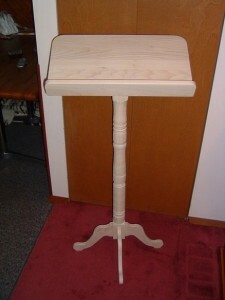 Her woodworking tool collection began with a handheld scrolling jig saw and she later added a table top scroll saw. Once she decided she wanted to learn turning, her husband bought her a lathe for Christmas and she has been turning ever since. For inspiration she often goes to the Lumberjocks Forum and finds pieces that interest her, which she then tries to duplicate. In addition to creating turned pieces, she also enjoys creating band saw boxes and intarsia, a form of wood inlaying, which you can see below in her aromatic cedar, cherry and poplar rose box. 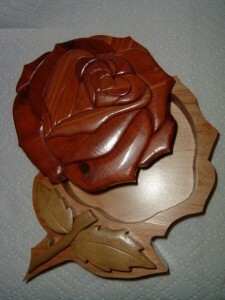 You can view more of Diane’s pieces at her Lumberjock website HERE.